Whether you celebrate “Mothering Sunday”, or its secular cousin “Mother’s day”, there are few busier days in the year for restaurants - when many consider it their sacred filial duty to take their dear old mum for Lunch or Dinner. However, many restaurateurs and publicans don’t recognise how huge the mother’s day weekend can be - and don’t prepare accordingly. As the big day approaches, is your business prepared to make the most of this huge opportunity? We looked into the vast Tenzo database to uncover exactly what happens to restaurants and pubs during this day of maternal appreciation. Hopefully, these insights can help your business to record a profit this weekend that would make your mother proud! Interested in more seasonal insights from the Tenzo database? Check out our posts on Valentine’s day and extreme weather, or subscribe to receive our data blogs in your inbox! Mothering Sunday will not be the only day to see a boost in sales - expect a similar, if not even bigger, increase on the Saturday. The weekdays preceding the Mother’s Day weekend do not appear to benefit from the boost. Different types of restaurants are not affected in the same way on the Mother’s day weekend. We will break down the rest of this post into insights and tips for fine dining restaurants, casual dining restaurants, and gastropubs. 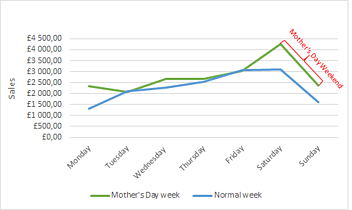 Note: The numbers given will be based on a comparison between the week of Mother’s day and the week after. What was the impact of Mother’s day on the whole weekend? On Mother’s day, sales at the fine dining restaurants using Tenzo increased by about 35% compared to a typical weekend. Clearly many sons and daughters want to treat their Mother’s to something special. In general over the entire Mother’s Day weekend, sales grew around 20%. Which was the busiest part of the day? Restaurateurs, get ready! People are more likely to offer a great dinner to their mum rather than a fancy lunch - the number of transactions at dinner on Mother’s day was 50% higher compared to at lunch on the same day. Mother’s Day dinner had a higher transaction number (+56% on the average) in most restaurants than any other Sunday dinner of the year (in some restaurants in the UK, the May bank holiday pipped mother’s day to the post). Tip: Tenzo’s advice would be to take a look at your staff scheduling and make sure you have a full complement of your best floor staff - Mother’s day is an opportunity to make a great impression with exceptional service, and it would be a shame to miss out on this opportunity because your waiters are too busy to give their best. What did customers order and how much did they spend? Spend per head decreased on Mother’s day last year, compared to a typical Sunday as diners ordered lower value main courses, and reigned in their spend on drinks. Our interpretation here is that while offspring get to choose the location to treat their Mothers, the Mother’s are hesitant to go crazy on their child’s credit card. As maternal instincts kicked in to protect kid’s bank balances, we saw large decreases in attachment rate for alcoholic beverages overall (down 30%), with sparkling wines and champagne some of the items hit the hardest. On the other hand, attachment rate of sides involving that most modest of ingredients, potatoes, shot up 57%! Tip: While it’s incredibly important to make the Mother’s feel like VIPs on their special day, don’t let your staff allow them to take control of ordering. Instruct them to encourage the sons and daughters to do the ordering - they will spend more. Perhaps also encourage floor staff to suggest higher-value items such as sparkling wines - it’s a day to make all mothers feel loved and spoiled, and should be helping to facilitate the spoiling! How many people should you expect on Mother’s Day? The number of guests increased by 25% and transaction number around 34%. Transaction size increased compared to a classic Sunday: bills were £4 higher than usual. This indicates a larger average group size than usual. Tip: Make sure you have enough larger tables suitable for families in your restaurant. You might have to combine smaller tables and optimise your layout around your new configuration. Casual dining restaurants using the Tenzo platform saw even bigger boosts over the mother’s day weekend compared to fine-dining establishments. Sales increased by 27% over the weekend as a whole. The biggest increase was actually on the Saturday (+31%! ), nevertheless, sales on mothering Sunday itself increased by 23%. Casual dining establishments should be prepared to be very busy throughout the entire day on both Saturday and Sunday. According to our data, all three mealtimes are important. While breakfast/brunch’s sales increased by around 16%, lunch’s sales grew by 13% on average. Dinner is the big winner here with 30% more sales compared to a usual Sunday! Tip: Make sure you schedule enough staff and think about their breaktimes in advance - there might not be an obvious time to let staff members have a rest, as business will continue flowing all day. Make sure your staff are not all worn out by dinner - which will be the main event. The main story here was the huge increase in sales of kids menu items - We saw an increase here of 58% were sold compared to a normal Sunday! Ordering patterns did not show many other clear patterns - the rising tide lifted all ships. In regards to spending patterns, we observed the same effect as in fine dining restaurants - with spend per head decreasing by 2%. This spend per head decrease was probably due to two factors, one, the increased number of children dining, and secondly the effect of mother’s not wanting to go too crazy at their offspring’s expense - see the Fine Dining Section. Tip: Make sure you are well set up for the arrival of families - have colouring pencils at the ready, as well as enough dustpans and brushes. Your floor is about to receive a good scattering of squashed chips, ketchup, and surreptitiously discarded vegetables. Tip: As for fine dining, we would recommend instructing your staff to encourage son’s and daughters to spoil their mothers - don’t let the Mothers do the ordering! At casual dining establishments, we recorded an increase of 14.5% more guests in comparison with a typical Sunday. Transaction number increased by 10% and transaction size remained around the same. These patterns suggest that you should expect a mild increase in group size - but not a dramatic one. In contrast to fine dining and casual dining businesses, pubs made most of their sales on Sundays during the Mother’s Day weekend. Pubs increased sales on Sunday by a huge 60% compared to a typical Sunday! Tip: Aside from the hectic Christmas period, Mother’s Day was the second busiest day of the year for the foody pubs using the Tenzo platform. It’s, therefore, an extremely important weekend - make sure you don’t neglect it as many publicans do - it can provide a huge early spring lift to your bottom lines, after a slow start to the year. Prepare to smash it! While examining the Mother’s Day data compared to a classic sunday, we observed that sales increased a lot at all three mealtimes. The winner was dinner with +50%, lunch second with +42% and finally breakfast with +30%. Tip: Prepare to be busy all day, building to a grand crescendo at dinner time - when you will be truly rushed off your feet. Make sure you have enough staff and that you have planned enough time to let them have a good rest between the huge lunch and dinner services. Customers in gastropubs and inns went mad for specials on the mother’s day weekend (+60%) and ordered a lot more starters (+30%) and drinks such as beer and wine (+40%). In contrast to the other restaurant types explored in this article, spend per head at gastropubs increased by a huge £10! Sales of Kid’s Meals also increased massively: by 50% compared to the Sunday after! The increase in spend per head is likely due to an increase in food orders compared to a typical sunday - when many punters show up just for drinks. Tip: For a special occasion, you need great specials. We suspect that the gastropubs using Tenzo prepared a set of “Mother’s Day” specials. It’s hard to know what exactly will be a hit here - our inkling would be lighter dishes with delicate flavours - fish, salads, and spring vegetable accompaniments. Tip: Just as we suggested for casual dining restaurants - make sure you are well set up for the arrival of families - have colouring pencils at the ready, as well as enough dustpans and brushes. Your floor is about to receive a good scattering of squashed chips, ketchup, and surreptitiously discarded vegetables. Again, we saw a huge boost in the number of guests: a rise of 45%! Transaction number increased by +27%. 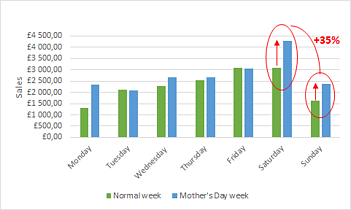 These numbers indicate that you should expect larger groups on the Mother’s day weekend compared with a regular weekend - Mum’s will show up with their whole clan in tow. Mother’s Day is very special day for many families, when they express gratitude and try to show their appreciation. The fact that they have chosen your restaurant shows that they think of your place as special - it’s a great honor! Make sure you return the appreciation by making sure their experience is joyful. Like any special day, preparing for Mother’s Day requires a deep understanding of your sales patterns and mider business, and an accurate idea of what your sales will be. Don’t hesitate to book a demo with Tenzo to learn how we can help.